Description: The American Traditional Stencil Company makes this awesome Cut & Fold template. These are so nice for creating woven designs with paper. Complete instructions are on the package and each template is made of heavy brass. This is the Large Star Border. 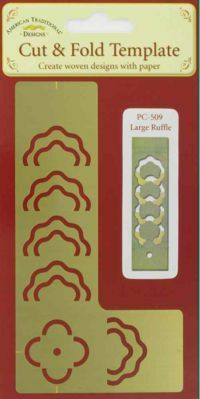 Size: Template is 3" x 5 1/2"
Description: The American Traditional Stencil Company makes this awesome Cut & Fold template. These are so nice for creating woven designs with paper. Complete instructions are on the package and each template is made of heavy brass. This is the Large Half Moon Border. Description: The American Traditional Stencil Company makes this awesome Cut & Fold template. These are so nice for creating woven designs with paper. Complete instructions are on the package and each template is made of heavy brass. This is the Large Chain Border. Description: The American Traditional Stencil Company makes this awesome Cut & Fold template. These are so nice for creating woven designs with paper. Complete instructions are on the package and each template is made of heavy brass. This is the Large Ruffle Border. Description: The American Traditional Stencil Company makes this awesome Cut & Fold template. These are so nice for creating woven designs with paper. Complete instructions are on the package and each template is made of heavy brass. This is the Large Wide Chain Border. Description: The American Traditional Stencil Company makes this awesome Cut & Fold template. These are so nice for creating woven designs with paper. Complete instructions are on the package and each template is made of heavy brass. This is the Large Wide Arrow Border. 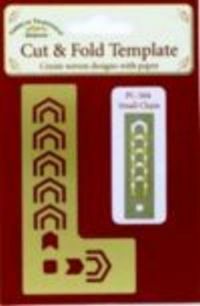 Description: This is a Small Arrow Border Cut and Fold Stencil made by the American Traditional Stencil Company. Just like the big ones only in a smaller version!! Description: The American Traditional Stencil Company makes this awesome Cut & Fold template. These are so nice for creating woven designs with paper. Complete instructions are on the package and each template is made of heavy brass. This is the Small Chain Border. Size: 2" X 3 3/4"